After special study, the German bishops’ conference decided to stick with the traditional wording in the Lord’s Prayer while the Italian bishops’ conference has decided to change the words of the prayer in their translation of the Roman Missal. The issue got wide attention after Pope Francis discussed the line, “And lead us not into temptation,” with Father Marco Pozza, a Catholic prison chaplain, Dec. 6, as part of a television series on the Lord’s Prayer. The German bishops’ conference announced Jan. 25 that after in-depth study, it would keep the line, “And lead us not into temptation,” unchanged, particularly to use the same wording as most Catholics and most other Christian denominations. But, it added, it would like to see more done in offering the faithful a clear and fuller explanation and discussion of the prayer’s meaning. The line in the prayer, the bishops’ committee said, is not about persuading God to not tempt the faithful, but rather it is a recognition of one’s own weakness and one’s trust in God’s guidance — that he does not lead people to make the wrong choice. However, when the Italian bishops’ conference adopted a new translation of the Bible in 2008, they chose “do not abandon us in temptation” for the Lord’s Prayer both in Matthew 6 and Luke 11. The Lectionary also contains the change and received Vatican approval. 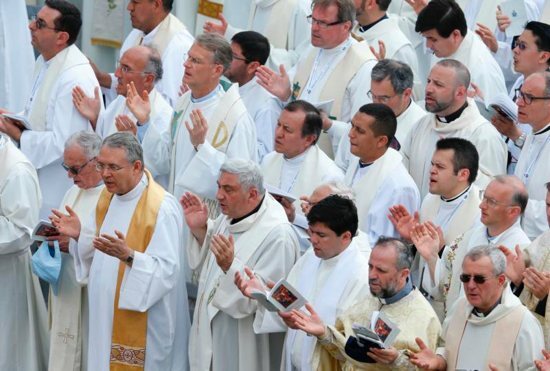 The conference has now called for an extraordinary assembly of bishops to meet Nov. 12-14 to discuss and approve the third edition of the missal, which would use the changed wording of the Lord’s Prayer for Mass and other liturgical rites. Both Cardinal Betori and the German bishops said they were pleased Pope Francis’ comments brought wider attention to the prayer and greater discussion of its meaning. It was important to “seize the opportunity” and offer better explanations, the German conference wrote.